The new Beginner’s Guide to SEO is here! What makes this new version so darn special and sparkly, anyway? I’m glad you asked! Our design team would breathe a sigh of relief and tell you it’s because this baby is on-brand and ready to rock your eyeballs to next Tuesday with its use of fancy, scalable SVGs and images complete with alt text descriptions. Our team of SEO experts would blot the sweat from their collective brow and tell you it’s because we’ve retooled and completely updated all our recommendations to ensure we’re giving fledgling learners the most accurate push out of the digital marketing nest that we can. Our developers would tell you it’s because it lives on a brand-spankin’-new CMS and they no longer have to glare silently at my thirteenth Slack message of the day asking them to fix the misplaced period on the fourth paragraph from the top in Chapter 7. All joking aside, every bit of the above is true, and each perspective pulls together a holistic answer: this version of the Beginner’s Guide represents a new era for the number-one resource for learning SEO, one where we can update it at the drop of a Google algorithm-shaped hat, where it’s easier than ever to access and learn for a greater variety of people, where you can rely on the fact that the information is solid, up-to-date, and molded to best fit the learning journey unique to SEO. I notice the structure is a little different, what gives? We can’t escape your eagle eyes! We structured the new guide quite differently from the original. 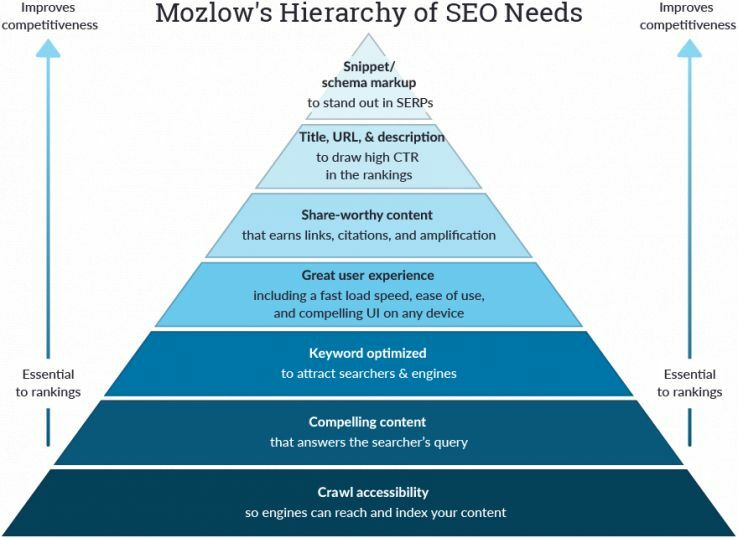 Everything is explained in our introduction, but here’s the gist: taking inspiration from Maslow’s hierarchy of needs, we built each chapter based on the core foundation of how one ought to go about doing SEO, covering the most integral needs first before leveling up to the next. We affectionately call this “Mozlow’s Hierarchy of Needs.” Please forgive us. Britney Muller, our brilliant SEO scientist and the brains behind all the new content. Words cannot do justice to the hours she spent alone and after hours before a whiteboard, Post-Its and dry-erase notes making up the bones and muscles and soul of what would someday become this fully-fleshed-out guide. For all the many, many blog comments answered and incorporated, for all the emails and Twitter messages fielded, for all the love and hard work and extra time she spent pouring into the new content, we have to give a heartfelt and extremely loud and boisterous THANK YOU. This guide wouldn’t exist without her expertise, attention to detail, and commitment to excellence. Kameron Jenkins, our SEO wordsmith and all-around content superheroine. Her exquisite grasp of the written word and extensive experience as an agency SEO were paramount in pulling together disparate feedback, finessing complicated concepts into simple and understandable terms, and organizing the information in ways most conducive to aiding new learners. Again, this guide wouldn’t be here without her positive attitude and incredible, expert help. Trevor Klein, editor extraordinaire. His original vision of organizing it according to the SEO hierarchy of needs provided the insight and architecture necessary to structuring the guide in a completely new and utterly helpful way. Many of the words, voice, and tone therein belong to him, and we deeply appreciate the extra polish and shine he lent to this monumental effort. Skye Stewart, talented designer and UX aficionado. All the delightful images you’ll find within the chapters are compliments of her careful handiwork, from the robo-librarian of Chapter 2 to the meat-grinder-turned-code-renderer of Chapter 5. The new Beginner’s Guide would be an infinitely less whimsical experience without her creativity and vision. Casey Coates, software engineer and mystical CMS-wizard-come-miracle-maker. I can safely say that there is no way you would be exploring the brand-new Beginner’s Guide in any coherent manner without his help. For all the last-minute additions to CMS deploys, for calmly fielding all the extra questions and asks, for being infinitely responsive and helpful (case in point: adding alt text to the image block less than two minutes after I asked for it) and for much, much more, we are grateful. There are a great many other folks who helped get this effort underway: Shelly Matsudaira, Aaron Kitney, Jeff Crump, and Cyrus Shepard for their integral assistance moving this thing past the finish line; Rand Fishkin, of course, for creating the original and longest-enduring version of this guide; and to all of you, our dear community, for all the hours you spent reading our first drafts and sharing your honest thoughts, extremely constructive criticisms, and ever-humbling praise. This couldn’t exist without you! With tender pride and only a hint of the sort of naturally occurring anxiety that accompanies any big content debut, we’re delighted and excited for you to dive into the brand-new Beginner’s Guide to SEO. The original has been read over ten million times, a mind-boggling and truly humbling number. We can only hope that our newest incarnation is met by a similar number of bright minds eager to dive into the exhilarating, challenging, complex, and lucrative world of SEO. Whether you’re just starting out, want to jog your memory on the fundamentals, need to clue in colleagues to the complexity of your work, or are just plain curious about what’s changed, we hope from the bottom of our hearts that you get what you need from the new Beginner’s Guide. Dive in and let us know what you think!